Orbital ATK has set a Nov. 11 launch date for the company’s eighth cargo resupply mission that will transport crew supplies and hardware to the International Space Station on behalf of NASA. The space agency said Tuesday Orbital ATK’s Cygnus spacecraft will launch aboard the company’s Antares rocket from the Wallops Flight Facility in Virginia to deliver approximately 7,400 pounds of cargo to ISS. 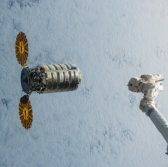 Cygnus will carry multiple CubeSats designed to perform various missions including tests of laser communication and increased data downlink rates as well as a study of spaceflight effects on bacterial antibiotic resistance. ISS crew will use the station’s Canadarm2 robotic arm to capture the spacecraft once it reaches the station and attach the vehicle to the bottom of ISS’ Unity module. NASA expects the spacecraft to leave the station on Dec. 4 to deploy CubeSats into orbit before re-entering the Earth’s atmosphere to burn up and dispose of trash. Orbital ATK nicknamed its Cygnus OA-8 vehicle after former astronaut Eugene Cernan, who was part of the Apollo 17 moon landing mission.